The Rexel Auto+ 300X Cross-Cut Shredder is part of the award-winning automatic shredder range from Rexel. Simply stack the shredder with up to 300 sheets of 80gsm paper (or 330 sheets if its 70gsm paper), then let the 300X automatically shred the paper for you. 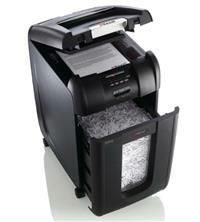 Forget having to manually feed the shredder, just stack and go! 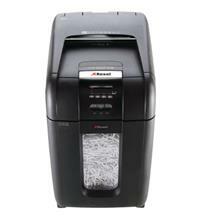 The shredder has a P-4 security rating, shredding paper into particles measuring 4 x 40mm. This makes it suitable for shredding highly confidential material, great for offices and the destruction of sensitive data. 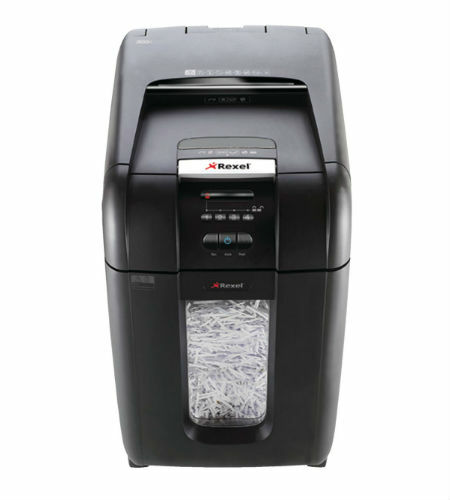 There is also no need to remove staples and paperclips prior to shredding as the Rexel Auto+ 300X Shredder can shred these too. In addition, it can also handle credit cards and CDs/DVDs if you have a requirement to shred these - and a handy separate CD/DVD tray is provided to collect the shredded CD/DVD shards and keep their waste separate from the paper waste. The shredder has a 40 litre pull-out bin that can hold up to 450 shredded sheets - and it also features a viewing window so you can easily see when it is getting too full. Manual shredding is also an option via a manual feed slot which can take up to 8 sheets of 80gsm paper. This will handle thick paper or card, multiple folded sheets (e.g. A3 paper folded in half), unopened mail (e.g. junk mail) and glossy paper (or a sheet covered with print on both sides). It also features a jam free indicator which alerts you if you are trying to feed too many sheets into the slot (this works via sensors in the paper feed area which measure the thickness of paper about to be shredded and raise a warning red light if it is too thick - green means it is OK to shred). Other features of this shredder include: easy to use controls; a 4 digit PIN code lock so you can lock the loading door during shredding and be sure your material is secure; automatic jam clearance (an intelligent jam clearance mechanism which forwards and reverses the machine in the relevant sequence to try and resolve the jam); a manual reverse option if the automatic jam clearance doesn’t clear the jam; door open, bin open, bin full and cool down indicators; automatic stop as a safety precaution if the bin or loading door are opened during shredding; self-cleaning cutters; environmentally friendly sleep mode after 2 minutes of non-use; castors for easy mobility; 230mm paper entry width for A4 shredding; ultra quiet operation at less than 60 dBA. Recommended for between 5 - 10 users, the Rexel Auto Plus 300X can be used continuously for 16 minutes, after which it will need a 40 minute cool down period. After the bin has been emptied three times, Rexel recommend using an oil sheet to keep the blades lubricated and working optimally - use Rexel oil sheets, code 2101948 and 2101949 (inserted into the manual feed slot, NOT the auto-feed chamber). A manufacturer’s warranty also covers the Rexel Auto+ 300X Cross-Cut Shredder, with 2 years cover for the machine and 15 years for the cutting blades.